A while back Meg Hunt decided she wanted to do something to help out people in Japan following the recent earthquake and tsunami, so she wrote a blog post asking for people to donate are to a charity auction to raise money. I was completely up for the idea. There was only one problem though. My art isn't all that special. I had a think about what I could do that might actually be worth people bidding on and hit the absolutely insane idea that I would make an exclusive print collection of Gilbert and Grim strips. I'm scanning and colouring one page away from getting that project finished. One copy will go for auction to raise money for Japan, one book will go to another charity auction at some later date and the other one will be kept in a nice safe box under my desk. After that there will be no more copies of the book and none of the extra work I did for it will ever appear anywhere else. I'll let everyone know, loudly and repeatedly, when the first one goes up for sale. 1 - Intro Page – Little bit of new art at the bottom, mostly me talking about why I'm doing the book and how I once slept through a hurricane. 2 - Stalked by Death - A brand new remake of the most redrawn page of the comic. 3 - Ignorance is Bliss - A brand new remake of a page from the original archive that somehow I've never got round to redoing before now. 4 - Frankenfood - Reworked version of the version in the main archive. Messed with the inks a little and then coloured it from scratch again. 5 - 2 Characters and a Couch - Another one from the original archive that I hadn't got round to redoing until now. 6 - Wibble - Partially re-inked from the version on the website. A strange hybrid between old and new. I think it works though. 7 - Grim Rabbit "Ink Drop" - A potential T-shirt design I did, now with funky abstract background. 8 - Stalked by a Demon - An old comic drawn again. 10 - Hospital Visit - Another remake of a comic from chapter one. 11 - N. Smith - Another partially re-inked page. 12 - The Pirate - Minor tweaks only on this one. 13 - Best Viewed with Firefox - Made some changes to the inks and then coloured with a new scheme. 15 - Grim and the Vikings by oppernaR - A scene from Chapter two as interpreted by Roland van Duijn (or oppy as I normally call him) of oppernar.com, The Webcomic List and the newly started Let Me Show You My Pokemans! 16 - Mag and the Grim Rabbit - My image of Mag Flamequill from The Life of Mag Flamequill having tea with Grim. 18 - Cross Hare Cover - A slightly different version of the Cross Hare fan art I drew a while back. 19 - The Best of What's Left - My take on Future Paladin from The Best of What's Left as a Gilbert and Grim style demon. 20 - Fox TV - A minor recoloured version of the interlude comic from chapter four. 21 -Boom - Some new art featuring Gilbert and William. 22 - Delivery Day - Fully redrawn version of the comic from chapter one. 23 - White Rabbit - Slightly edited and partially recoloured version of another chapter one comic. 24 - Graveyard Grim - The poster design I posted on the site. 25 - Hippy Cat - An image of an as yet unnamed character who appeared a couple of times in chapter four. I don't think I've ever put this one online before. There's also some other stuff on that page too. 27 - I wish I was a punkrocker - A brand new version of the image of Thalia that I posted on my DA page. 28 - Greatest Invention ever - A brand new version of another chapter one comic. 29 - Annoying appointment - A brand new, extra special page written just for the book. 30 - Cover re-coloured - Exactly what it says on the tin. 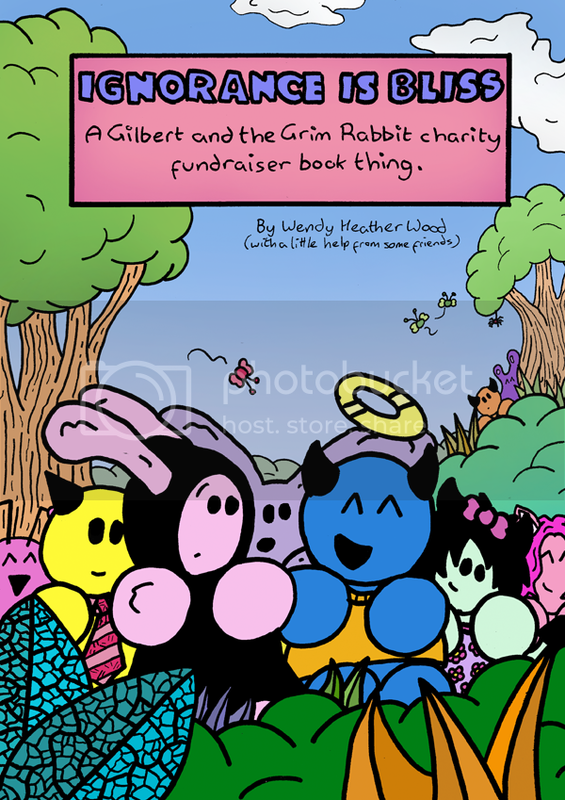 It's the cover/title page for Gilbert and the Grim Rabbit with new colours. 31 - Toxic - A partially recoloured version of the comic from the archives. 32 - Back page credits and holiday art- A few notes and recoloured versions of one Valentine's and one Christmas piece.